238 Years Later, Would Americans Still Choose Freedom Over Slavery? Imagine living in a country where armed soldiers crash through doors to arrest and imprison citizens merely for criticizing government officials. Imagine that in this very same country, you’re watched all the time, and if you look even a little bit suspicious, the police stop and frisk you or pull you over to search you on the off chance you’re doing something illegal. Keep in mind that if you have a firearm of any kind while in this country, it may get you arrested and, in some circumstances, shot by police. If you’re thinking this sounds like America today, you wouldn’t be far wrong. However, the scenario described above took place more than 200 years ago, when American colonists suffered under Great Britain’s version of an early police state. It was only when the colonists finally got fed up with being silenced, censored, searched, frisked, threatened, and arrested that they finally revolted against the tyrant’s fetters. No document better states their grievances than the Declaration of Independence. 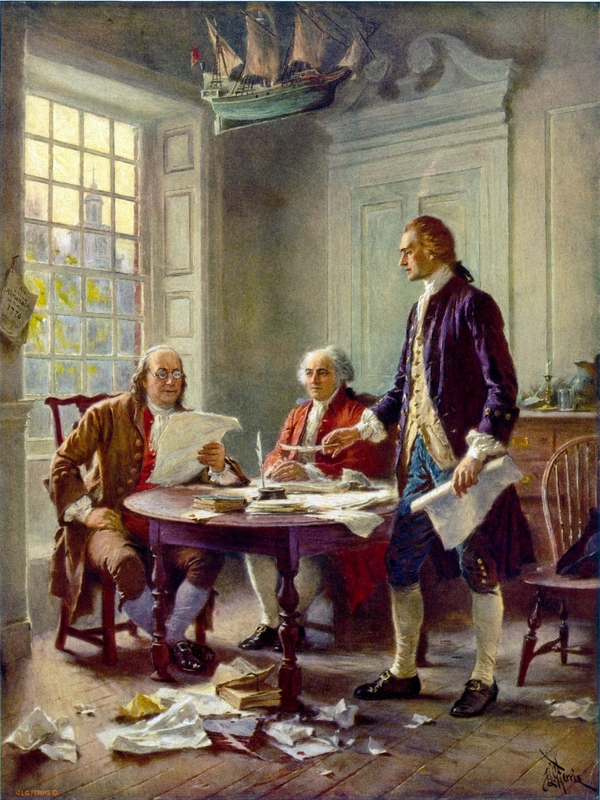 A document seething with outrage over a government which had betrayed its citizens, the Declaration of Independence was signed on July 4, 1776, by 56 men who laid everything on the line, pledged it all–“our Lives, our Fortunes, and our sacred Honor”–because they believed in a radical idea: that all people are created to be free. Labeled traitors, these men were charged with treason, a crime punishable by death. For some, their acts of rebellion would cost them their homes and their fortunes. For others, it would be the ultimate price–their lives. Yet even knowing the heavy price they might have to pay, these men dared to speak up when silence could not be tolerated. Even after they had won their independence from Great Britain, these new Americans worked to ensure that the rights they had risked their lives to secure would remain secure for future generations. The result: our Bill of Rights, the first ten amendments to the Constitution. Imagine the shock and outrage these 56 men would feel were they to discover that 238 years later, the government they had risked their lives to create has been transformed into a militaristic police state in which exercising one’s freedoms is often viewed as a flagrant act of defiance. Indeed, had the Declaration of Independence been written today, it would have rendered its signers terrorists, resulting in them being placed on a government watch list, targeted for surveillance of their activities and correspondence, and potentially arrested, held indefinitely, stripped of their rights and labeled enemy combatants. The First Amendment is supposed to protect the freedom to speak your mind and protest in peace without being bridled by the government. It also protects the freedom of the media, as well as the right to worship and pray without interference. In other words, Americans cannot be silenced by the government. Yet despite the clear protections found in the First Amendment, the freedoms described therein are under constant assault. Whether it’s a Marine detained for criticizing the government on Facebook, a reporter persecuted for refusing to reveal his sources, or a protester arrested for standing silently in front of the U.S. Supreme Court, these are dangerous times for those who choose to exercise their rights. The Second Amendment was intended to guarantee “the right of the people to keep and bear arms.” Yet while gun ownership has been recognized as an individual citizen right, Americans continue to face an uphill battle in the courts when it comes to defending themselves against militarized, weaponized government agents armed to the hilt. In fact, court rulings in recent years have affirmed that citizens don’t have the right to resist police officers who enter their homes illegally, mistakenly or otherwise. The Third Amendment reinforces the principle that civilian-elected officials are superior to the military by prohibiting the military from entering any citizen’s home without “the consent of the owner.” Unfortunately, the wall of separation between civilian and military policing has been torn down in recent years, as militarized SWAT teams are now allowed to burst into homes unannounced in order to investigate minor crimes such as marijuana possession and credit card fraud. With domestic police increasingly posing as military forces–complete with weapons, uniforms, assault vehicles, etc.–a good case could be made for the fact that SWAT team raids constitute the forced quartering of soldiers within the private home, which the Third Amendment was written to prevent. The Fourth Amendment prohibits government agents from touching you or placing you under surveillance or entering your property without probable cause and even then, only with a court-sanctioned warrant. Unfortunately, the Fourth Amendment has been all but eviscerated in recent years by court rulings and government programs that sanction all manner of intrusions, including giving police carte blanche authority to break into homes or apartments without a warrant, conduct roadside strip searches, and generally manhandle any person in manner they see fit. Moreover, in the so-called name of national security, intelligence agencies like the National Security Agency now have the ability to conduct mass unwarranted electronic intrusions into the personal and private transactions of all Americans, including phone, mail, computer and medical records. All of this data is available to other government agencies, including local police. The Fifth Amendment is supposed to ensure that you are innocent until proven guilty, and government authorities cannot deprive you of your life, your liberty or your property without following strict legal guidelines. Unfortunately, those protections have been largely extinguished in recent years, especially in the wake of Congress’ passage of the National Defense Authorization Act (NDAA), which allows the president and the military to arrest and detain Americans indefinitely without due process. The Sixth Amendment was intended to not only ensure a “speedy and public trial,” but it was supposed to prevent the government from keeping someone in jail for unspecified offenses. That too has been a casualty of the so-called war on terror. Between the NDAA’s indefinite detention clause and the Authorization to Use Military Force (AUMF) legislation, which has been used as justification for using drones to kill American citizens in the absence of a court trial, the Sixth Amendment’s guarantees become meaningless. The Seventh Amendment guarantees citizens the right to a jury trial. However, when the populace has no idea of what’s in the Constitution–civic education has virtually disappeared from most school curriculums–that inevitably translates to an ignorant jury incapable of distinguishing justice and the law from their own preconceived notions and fears. The Eighth Amendment is similar to the Sixth in that it is supposed to protect the rights of the accused and forbid the use of cruel and unusual punishment. However, the Supreme Court’s determination that what constitutes “cruel and unusual” should be dependent on the “evolving standards of decency that mark the progress of a maturing society” leaves us with little protection in the face of a society lacking in morals altogether. America’s continued reliance on the death penalty, which has been shown to be flawed in its application and execution, is a perfect example of this. The Ninth Amendment provides that other rights not enumerated in the Constitution are nonetheless retained by the people. Popular sovereignty–the belief that the power to govern flows upward from the people rather than downward from the rulers–is clearly evident in this amendment. However, it has since been turned on its head by a centralized federal government that sees itself as supreme and which continues to pass more and more laws that restrict our freedoms under the pretext that it has an “important government interest” in doing so. Thus, once the government began violating the non-enumerated rights granted in the Ninth Amendment, it was only a matter of time before it began to trample the enumerated rights of the people, as explicitly spelled out in the rest of the Bill of Rights. As for the Tenth Amendment‘s reminder that the people and the states retain every authority that is not otherwise mentioned in the Constitution, that assurance of a system of government in which power is divided among local, state and national entities has long since been rendered moot by the centralized Washington, DC power elite–the president, Congress and the courts. Indeed, the federal governmental bureaucracy has grown so large that it has made local and state legislatures relatively irrelevant. Through its many agencies, the federal government has stripped states of the right to regulate countless issues that were originally governed at the local level. Thus, even on those rare occasions when the courts provide us with a slight glimmer of hope that all may not be lost, those brief reprieves of judicial sensibility are quickly overwhelmed by a bureaucratic machine that continues to march relentlessly in lockstep with the police state. This brings me back to those 56 men who risked everything–their fortunes and their lives–to speak truth to power in that sweltering Philadelphia heat 238 summers ago. Of those 56 signers, 9 died during the Revolution, 5 were captured by British soldiers, 18 had their homes looted and burned by the Red Coats, 2 were wounded in battle and 2 lost their sons during the war. Remarkably, these men–who were community leaders, business owners, judges, lawyers and inventors–sacrificed their lives, their fortunes and their sacred honor so that you and I could live freely in a nation where we have the right to stand up and speak out against tyrannical government. In the face of torture and even death, they did not waver. The choice before us is clear. In the words of Patrick Henry, will we choose dangerous freedom or peaceful slavery?